During last SHIPtember, Ryan Olsen created a SHIP based on Babylon 5 - the EAS Agamemnon. I stumbled across it at the time thanks to some Lego blogs, and at the end of the year decided to build one for myself. Credit for the original Lego design goes to Ryan, of course! Here's the end result (Flickr album here) - my pics & lighting are not studio-quality, unlike Ryan's! The middle section rotates (manually) and stays put at any angle, so it's well balanced and the turntables provide enough friction to keep it stable. Stats-wise, it's about 95cm (~117 studs) long, 35cm tall and 15cm wide, using ~4700 bricks, weighing-in at just over 3.7kg (8.2lb). I made some guesses as to internal structure (e.g. the turntable connections in the rotating section) and the greebles on top & bottom are my own, but it's very close to Ryan's original design and some reference images of the original. Ryan was kind enough to share the image files he used for the stickers, so I was able to complete the model. I couldn't connect the front & rear side plating in LDD - as I learned here, the connections are just illegal as there's not enough clearance between the side plates and overhanging top & bottom plates in software - however, it obviously works in the brick. I converted the LDD to an LDraw file (using SylvainLS's updated parts mapper here) and used LDCad (which can ignore collisions) to place the plates in order to use POV-Ray to make the renders you can see in my album. I learned a lot doing that! Note that I made some tweaks in-the-brick but haven't re-done the LDraw file or any renders to reconcile the minor differences. It was a fun, frustrating at times, but very rewarding journey, and I'm really happy how it turned out. The SHIP looks awesome on display in my living room. Thanks for the inspiration, Ryan, and thanks to those on this site who helped with the digital stuff! 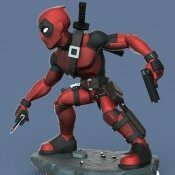 Replaced PhotoBucket URL for 360 render. My all time fav sci- fi series! Did you see Ryan's little Starfury fighters? Will you build some? Are you building me one next? Heh. For a sufficient fee I suppose anything's possible. Thanks, Inkpanther! 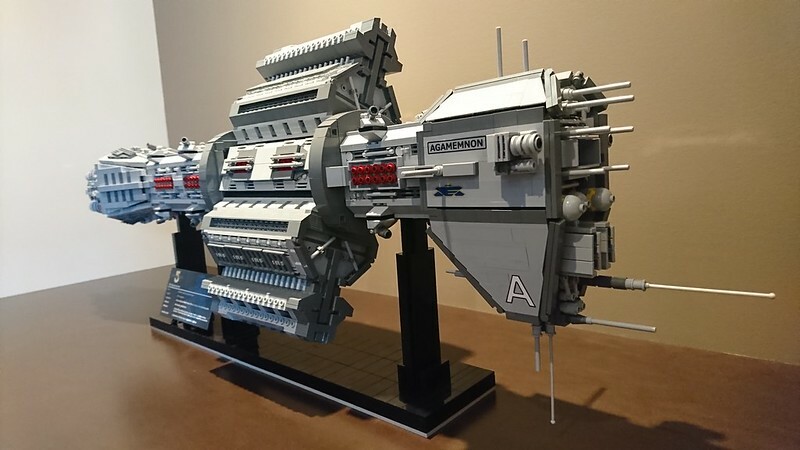 I think the mini/micro-scale ones you've shared renders of elsewhere are also awesome builds, particularly the Centauri warship (love the vibrant colours). You're doing your part to keep it alive! 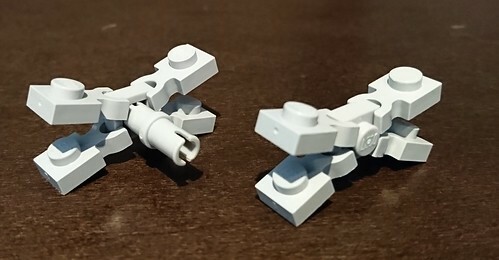 I was wondering last night what size a B5 MOC would be if the main cylinder was built using rings the same scale as the two DBG ones on this MOC. I'm thinking it'd be over 4 feet long... Not sure I have the MOCcing chops quite yet for something that scale, though! I agree, Bob (may have to go watch some) - and thanks, guys! My little ships are hardly comparable to your creation. The Agamemnon is huge and incredibly detailed. The centre structure was another story. My original design has a tendency to twist when turning each end, which loosens some of the axles/thin liftarm combinations and makes the internal structure increasingly unstable. I've redesigned it to incorporate t-shaped and h-shaped liftarms to prevent twisting. I've also come up with a design that I hope will work to attach each end to the frame of each section, although I have an idea on how to reinforce that connection. The lime coloured liftarm with perpendicular axle connectors could be replace with slightly longer 3L versions that have 2 pin holes. This fits inside and has more than adequate clearance during rotation. Good idea to continue here. The first & third pics didn't come through again (and I noticed my 360 render from Google photos has broken in the first post as well, and I can't embed it again - ), but your second pic with the bracing Hs & Ts looks great - good workaround, and I'm glad to hear it all rotates nicely! I can't see the first pic but I know what you mean - I added them on a hunch, to provide some bracing through the centre to tie together the two "lobes" and help with balance/rotation/etc, not because I encountered a problem just using the clutch of the studs to hold the weight onto the outside of the frame. They may be redundant, I dunno... I actually never tried it the other way! Grrr... Google Photos and it's permissions for sharing images is a right pain in the big behind. Can see why many prefer Flickr. Anyway, tonight I decided to complete the central superstructure design. I suspect that I've got changes to make to this, especially around the length proportions due to the use of older technic turntables. So, in the image below, Bright Light Orange parts can be any colour as they are not visible in the final construction. The white pieces are the choices/changes i've made so far. Eventually I'll consolidate parts where possible to manage the costs/part count. An interesting development in adapting all the hull panels and the position of the "ring" sections on either side of the centre of the rotating section... I thought that there might gaps or overlaps, and I was right. @manglegrat's design had tiles on the inside face, closing the gap between the ring and centre section. I thought that the change in turntable type would increase that gap, but as it turns out, if I remove the tiles, there is no gap when those rings are placed immediately adjacent. To prevent catching on any of the plating, I've flipped them, but now have the exposed inner construction and no flat face. The techniques used are challenging to adapt. The changes I'd made also required some framework/superstructure changes as well as hull panels... and somewhere along the line, I've shortened the fore and aft sections by 1 stud each (I think it's originally from the changes to those ring structures and moving them). Here's a few cutaways to show the progress so far. Interesting! That gap is in my version and in Ryan's original - I just concealed it with those tiles, but Ryan left it open - so well done in finding a way to remove it! Dagnabit! The links didn't work again. I think I'm just going to have to bite the bullet and setup a Flickr account.... Google Photos just isn't playing nice. Let's see if I can insert them this time. Those clearances are looking really good, I assume you'll move the front ring back a stud to line up with the end of the white 1x plates, and take out the tiles to close that up? I'm enjoying following your progress, keep 'em coming! Awesome. Think I've figured a workaround to keep using Google Photos at this stage. Thanks man. I Think the use of the larger turntables was the key, not just for inner radius but for the depth/height to provide the stud alignment. Yeah, I plan to try build a test of the ring structure as it currently is to see if anything catches, and if not, will likely leave the flat surface facing out to hide the detailed inner working side with the rotating section. I also started looking at the dimensions of the Warlock Class destroy and it's approximately 10% longer, so it will likely crack 1mtr in length if I stick to the same scale. Hopefully I can start doing some preliminary structural design over the next month. I do not know the series, but the ship is awesome. Babylon 5 was a pioneer in science fiction television as it was conceived with the idea of a long term narrative that played out over multiple seasons. Events that occur early in Season 1 have relevance and implications throughout all 5 seasons. It also pushed advancement in CGI, with early seasons using 3D rendering on the Amiga platform using Lightwave. It was rumoured that at the time the production team for Babylon 5 could produce 5 episodes for the same cost as a single episode of Star Trek: The Next Generation, mainly because of the use of CGI. So, a quick update on the re-design of the internal frame for this MOC. I've reduced the use of the H-liftarms to just the internal connecting axle that joins the front and rear sections. The internal framing has been assembled in bricks and the rotating mechanism tested without external panels attached. The build withstands the mass and torsion that the rotating section currently has, so the next test is to add the panels and deck sections of the rotating section, as well as the adjacent ring structures, and see if the stand connects in locations that effectively balance mass and friction enough to allow free rotation. I have an idea for mounting a small gear to the underside of the rear section and connecting it by a chain to the rotating section, I'm just not sure how to avoid clashes with hull plating in that section at this time. I'm thinking the next phase should start with the stand, then the ring structures adjacent to the rotating section, then hull plating. Attempting to figure out why Google Photos links not working. Issues with the links again. All I get is a transparent looking image (grey & white checks) with a "no entry" symbol in grey in the middle. Ok, have edited my previous post to try get those images to display. Should be visible now if you want to check. An update on the design challenge around the rotator rings. As good as @manglegrat's solution is, with the changes I've made, a 180-degree flip fits them tight up against the rotating section, but leaves their internal workings open. I've had a few ides that have met with varying degrees of success. The only other modification that has been required was to adjust the location of the stand supports and holes in the ship. Those updated pic links work - whatever you did there, keep doing it. Nice to see your progress, and I'm excited to see your next update. Looking good! If you can make any reinforcing changes to the engine section, that'd be awesome! In both of mine they suffer from a little bit of gravity sag. It's not terrible but if you look close you can see that the weight of the whole assembly puts a bit of strain on the liftarms it's fixed to (even though they're quite reinforced inside the frame!) and the line isn't 100% horizontal. 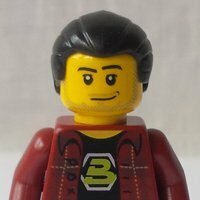 Just some minor gripes with my back-end. Ooer. 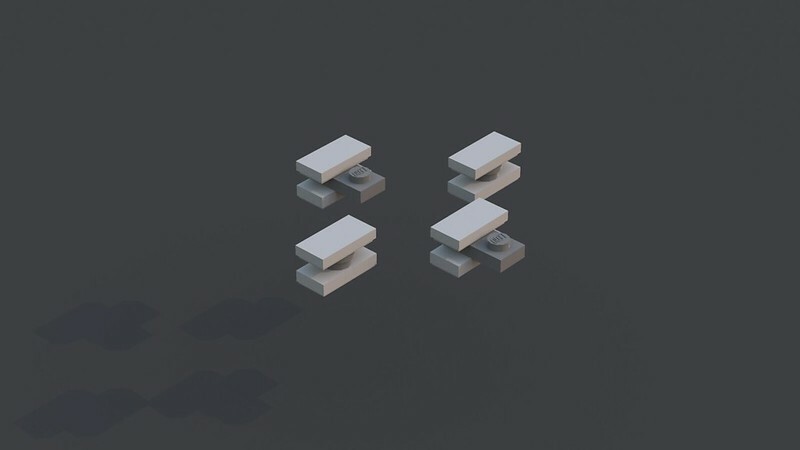 I've also been able to come up with a simple solution for the rotator guide rings that not only fits, but secures the components of the connector between fore and aft sections. You can see the Technic 1x2 brick with axle hole on each of the side sections. These line up with and secure the axle seen in the third image. Each of the sides and upper/lower parts of the ring are built separately and assembled onto the frame to complete the rotator guide ring. The side sections lock the axle in place, and the top and bottom lock the sides and complete the ring. I may have to rebuild my engine section around those modifications - looks like it will provide both more bracing onto the main frame to hold the weight horizontal, and more droop-resistant engines on the bottom side. Great work, thanks for sharing the pics! Nice work with the rings, too, looks like it'll be pretty solid! Bummer those 99206's aren't in DBG yet (why, TLG, why?!). Looks like there's a half-stud gap remaining between the rings and the side panels, though. Another wee gotcha to fix! The alignment of the panels changed by a half-stud back exactly the same way between the Agamemnon and the Schwarzkopf. I ended up solving that one by shuffling the "middle" technic brick in the frame along by a half-stud (a big yay for hollow studs) and hanging them off of that, rather than using the top & bottom parts of the frame.